Nelson Cheese & Deli is recognized as the gold standard in prepared food because our deli sandwiches, salads, soups, desse rts and cheeses are all prepared with the homemade care and devotion to quality that only a family owned business can provide. We have a large variety of trays from dessert to meat and cheese. Selecting the tray size and/or the number of trays depends upon the type of event you are planning and the amount of other foods to be served. 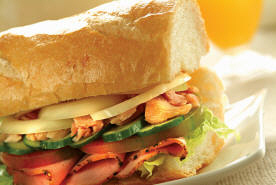 Nelson Cheese & Deli has a range of delicious lunch offerings including soup, sandwiches and salads. Call ahead, phone orders are welcome.